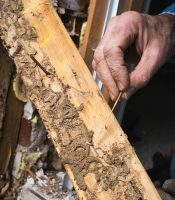 If you suspect your home in San Diego, California, may have termites, contact the experts at Kilter Termite and Pest Control right away. Leaving a termite infestation untreated for too long can result in extensive damage to your home that can be expensive to repair. Plus, there’s nothing to lose by calling Kilter because we’ll provide you with a completely free, no-obligation termite inspection. Additionally, Kilter can help you restore any damage that termites have done in your home after the infestation has been eliminated. We have a team of experienced craftsmen who adhere to best practices, such as using only construction-length boards, to replace any damaged wood in your home. Contact Kilter Termite and Pest Control today to arrange a free termite inspection at your home in San Diego, CA.